Add a little craziness to your celebrations with the Bachelorette to Bride range from party supplies company Life is a Party. These elasticated hair ties are 0.6" x 3.75" (1.5cm x 9.5cm) when on their card. (Circumference is 5.9" (15cm), excluding knot.) 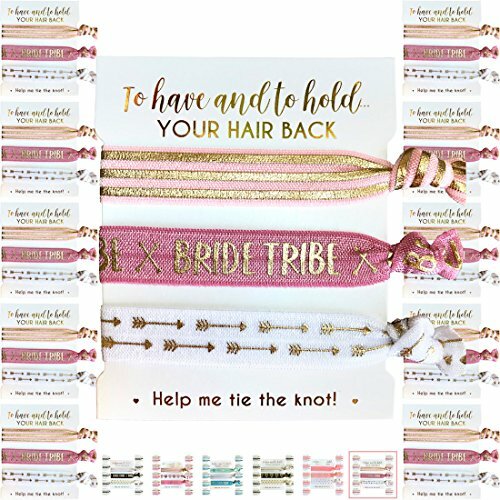 Each set contains 10 cards, each with 3 elasticated hair ties for a total of 30 hair ties. Guaranteed to light up your event, day or night. Stocks are limited. Order today or risk missing out! MEGA PACK - Contains 10 cute cards, each with 3 even cuter elasticated hair ties. That's a total of 30 adorable hair ties! UP THE EXCITEMENT - It's an exciting time of your life. Let these little party starters get the gals going. Or send them in advance to build anticipation. DAY OR NIGHT - Fun for both daytime and nighttime events. Elasticated to fit all. BEST. FAVOR. EVER. - Click "Add to cart" today then prepare for squeals of delight! If you have any questions about this product by Bachelorette to Bride, contact us by completing and submitting the form below. If you are looking for a specif part number, please include it with your message.